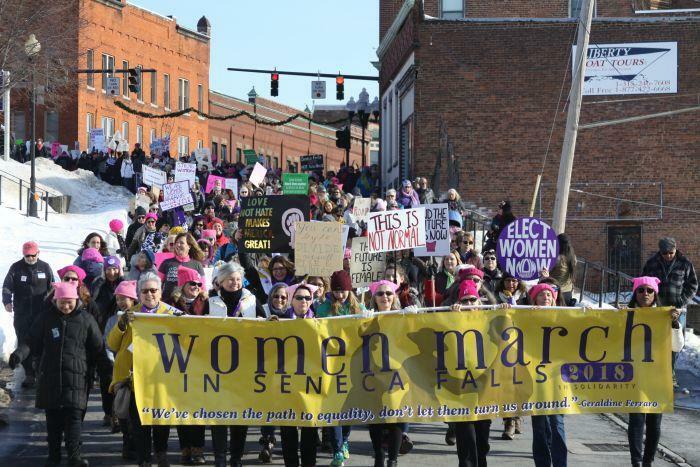 Thousands of women flocked to Seneca Falls in 2018 for the second annual march. Organizers of Saturday’s third annual Women March in Seneca Falls say they're not experiencing the same lack of unity that's been reported among leaders of the Women's March on Washington, D.C.
Charges of anti-Semitism have cast a shadow over the national event. But in Seneca Falls, march organizer Leah Ntuala says their commitment to inclusion and diversity have never wavered. "I think at the core, we all believe the way that some of our early female organizers believed, that you ask for the door of equality to be open but you don't tell people what to do or what to believe with equality once they have it." Ntualla and fellow organizer Melina Carnicelli say marchers of all different political views are welcome to attend. "When we say we're inclusive, we mean that sincerely and we have welcomed folks of all persuasions in the past two years expect that to be the same this year,” Carnicelli said. “As long as there's a respect and an interest in equality and social justice, we invite everyone to be present." The starting point for Saturday’s events had to be changed due to the partial government shutdown. A 10 a.m. kick-off rally at the Women's Rights National Historical Park was moved two blocks down Fall Street to Trinity Park. "Our permit was pulled by the National Park Service unless we came up with $15,000 unless we paid staff to be there on that day, which we were not going to do,” Carnicelli explained. The march itself will begin at 11:30 a.m. followed by a music festival at the end of the march route at 12:30 p.m. The first Seneca Falls Women March in 2017 drew an estimated 10,000 people. In 2018, 15,000 attended. Carnicelli said there seems to be an equal amount of interest this year, but unlike the last two years, a severe winter storm is forecast for the Finger Lakes region. "We're still on; everything is a go,” she said. “The storm that I'm hearing as predicted...our event will be over. We're going to be done in the early afternoon." The march will also be streamed live on the event’s Facebook page.